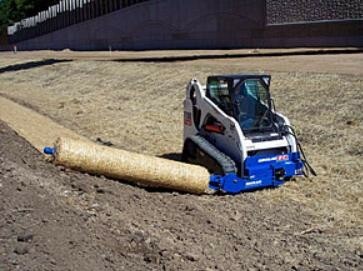 The EZR Material Roller is a productivity tool that can save hundreds of hours installing erosion control blankets of all types. It can also be used for other rolled materials such as nonwoven geotextiles and vineyard nettings. The boom on the Material Roller can be controlled from the cab. 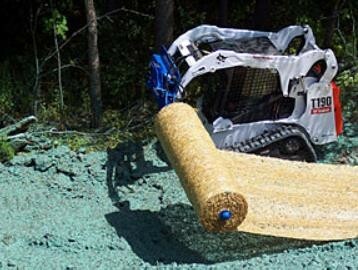 It can swing 180° to unroll from the right or left side of the skid steer. 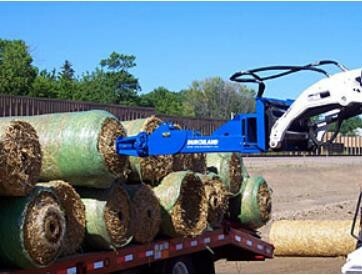 The boom can also be positioned straight out from the cab to unload rolls directly from a trailer. 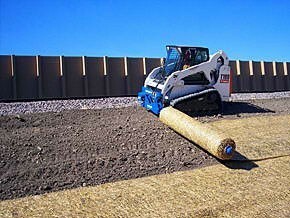 This allows the contractor to use larger rolls that could not be handled manually. This saves material cost and time.